GUTHRIE, Okla. – The second round of the Timed Event Championship featured fast times, wild runs and possibly a season-ending injury to a reigning world champion. Two-time winner Daniel Green came through Day 1 of the three-day, five-round “Ironman” Event of ProRodeo atop the leaderboard, scoring a cumulative time of 112.4 seconds through 10 runs. He also posted the second-fastest round so far on Friday night with a 51.0, just half a second behind Jess Tierney. Meanwhile, two-time and reigning PRCA World Champion header Chad Masters is likely out of the competition. Members of the Lazy E Sportsmedicine crew reported that he suffered a serious knee injury while trying to wrestle his steer Friday night. Because of his solid finish to opening day, Tierney moved into a tie for second place with Trell Etbauer. Both men stand at 115.8 seconds, just a 10th of a second ahead of Landon McClaugherty. McClaugherty is having one of his strongest runs at the Lazy E since he’s been part of the competition. Like many, McClaugherty loves the competition, primarily because it takes a solid all-around cowboy to excel. It’s also one of the most prestigious. Remaining performances are noon and 7:30 p.m. Saturday and 1 p.m. Sunday. AVERAGE LEADERS: 1. Daniel Greeen, 112.4 seconds through two rounds; 2. Trell Etbauer and Jess Tierney, 115.8; 4. Landon McClaugherty, 115.9; 5. Dustin Bird, 125.9; 6. JoJo LeMond, 127.1; 7. Erich Rogers, 130.2; 8. Spencer Mitchell, 137.3. FASTEST ROUND LEADERS: 1. Jess Tierney, 50.5 seconds; 2. Daniel Green 51.0; 3. JoJo LeMond, 52.9; 4. Clayton Hass, 54.5; 5. Spencer Mitchell, 55.5; 6. Trevor Brazile, 55.8. ROUND 2: 1. Jess Tierney, 50.5 seconds; 2. Daniel Green 51.0; 3. JoJo LeMond, 52.9; 4. Spencer Mitchell, 55.5; 5. Landon McClaugherty, 58.0; 6. Paul David Tierney, 62.2. ROUND 1: 1. 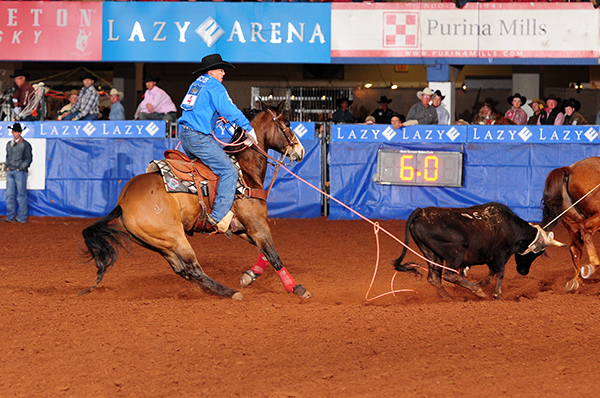 Clayton Hass, 54.4 seconds; 2 Trevor Brazile, 55.8; 3. Trell Etbauer, 57.7; 4. Landon McClaugherty, 57.9; 5. Mike Outhier, 58.4; 6. Dustin Bird, 60.3.